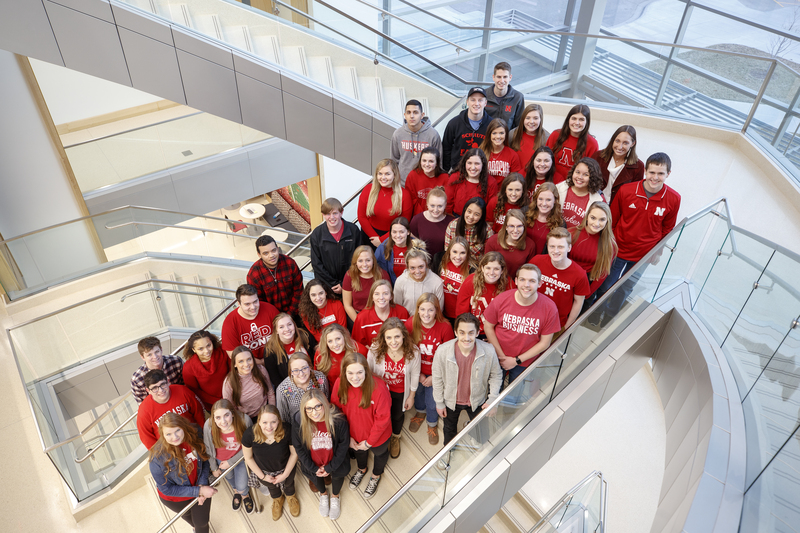 The Clifton Strengths Institute at the University of Nebraska–Lincoln College of Business has selected 47 students to serve as new strengths coaches for the 2019-20 school year. The new coaches will join returning coaches to mentor more than 750 first-year business students in Professional Enhancement I: Investing in Strengths. Required for all first-year business students, the course aims to help students develop and apply their strengths to achieve individualized academic, personal and professional success using the CliftonStrengths Assessment. During the course, coaches lead team meetings of up to 10 students once a week and facilitate two one-on-one strengths coaching sessions for each team member to help them recognize and maximize their potential. They also help facilitate discussions during class. "Starting their college career by identifying their natural talents, our students learn how to identify classes and build careers that allow them to do what they do best while developing meaningful relationships that go beyond college," said Mike McDonald, senior workplace consultant and performance lead for Gallup and instructor of Investing in Strengths. "The individualized coaching helps them apply their strengths toward their goals and ultimately build a better life." Open to students from any college at Nebraska, prospective coaches complete an application and interview process. Once selected, they enroll in the Strengths Coaching, Theory and Practice Training Course, a three-credit-hour course focused on gaining functional knowledge in strengths-based development. "This course allows strengths coaches to develop their talents and gain the skills, knowledge and confidence they need to be prepared when coaching their students in the fall to build lives of meaning, purpose and impact," said Samantha Kennelly, Clifton Strengths Institute assistant director. The student coaches are from six states and two countries. Forty attend the College of Business. "We select students who have the passion and energy to positively impact the lives of others and the innate talent to easily connect and communicate with people to help guide their development," Kennelly said. "First-year students thrive when our coaches recognize their unique potential and guide them to succeed by leading with their strengths." For more information on strengths coaches and the Clifton Strengths Institute, click here.